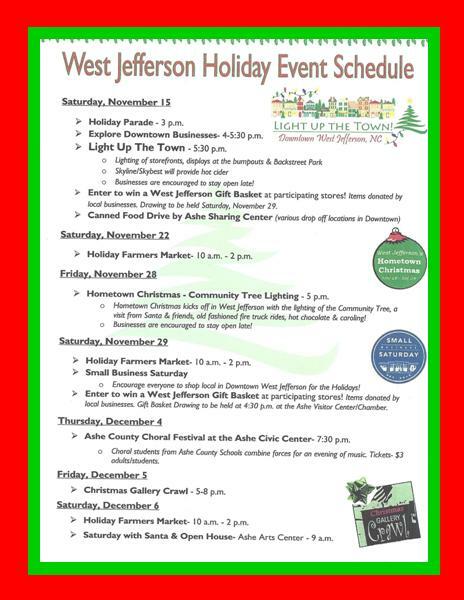 West Jefferson 2014 Holiday Event Schedule! Be sure to come out and share in all the fun festivities! Support the businesses and shops in West Jefferson during the Holiday season! Since its incorporation in 1799, Ashe County has represented the best of what North Carolina has to offer. Ashe is the northwestern most County in the state, has a population of 27,000-plus, covers 426 square miles and enjoys an approximate elevation of 3000 feet. Four distinct and beautiful seasons are evident in our county, and a strong tourism sector exists as people from across the state and the nation come to enjoy our beauty. Ashe County is known for many things including a thriving Christmas Tree Industry that has furnished several trees for the White House and a Choose and Cut season offering the opportunity for families to come and enjoy the mountains and return home with one of our beautiful Christmas trees. If you are visiting for the day, or thinking of relocating to Ashe County either full-time or part-time, A1 Mountain Realty wants you to know that you are a welcome member in our community and would gladly help you with all your Ashe County NC Real Estate needs! Stop by our office on main street in West Jefferson or check out our listings from our website (www.a1mountainrealty.com) or you can do a MLS search for any High Country Real Estate! ← Choose and Cut Christmas Festival!